This is one of the P-47D models flown by the 354th From November 1944 through February 1945. They had their Mustangs taken away to modify the planes for carrying the extra .50 caliber machine guns in the wings. Ken Gorman being trained in P-47's was instrumental in helping fly over the P-47's to their base when he transferred into he unit. Ken would be shot down in one of these P-47's over Germany and become a prisoner of war until their camp was liberated in 1945. The man on the wing is there to help the pilot see what is in front of him as he zig zags his plane down the runway preparing to take off. Lt. Ken Gorman from Richmond, Virginia would join the 354th FG on December 4, 1944. Being trained in the P-47 he played an important role in the transition to the P-47 and helped fly in the new planes to the unit. His time with the 354th FG would be short. On the mission of February 10,1945 he was trying to locate and determine the position of Lt. News P-47 that had been shot down. He saw that Lt. New was dead but had to belly in himself. 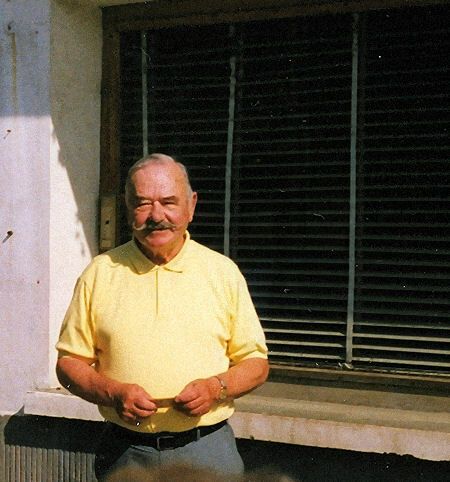 He would be captured by the Germans and remained a prisoner of war until his camp was liberated later in 1945. 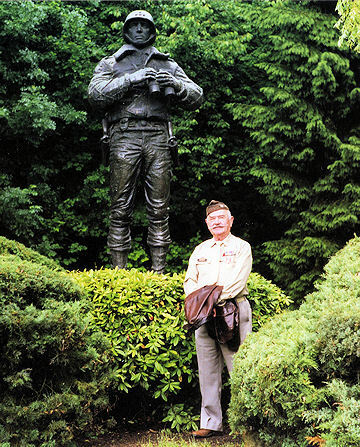 Ken Gorman standing beside the General George S. Patton Memorial in Luxembourg in June of 1997 at the reunion in Luxembourg. Ken Gorman revisiting the French airbase "A98" at Nancy, France that the 354th was flying from in the winter of 44'- 45' during the "Battle of the Bulge".